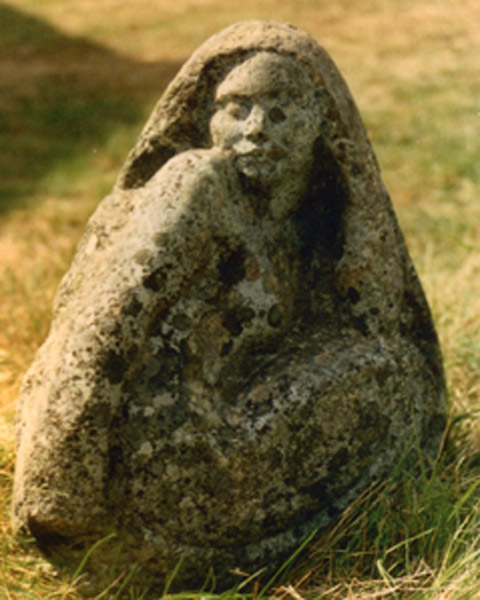 From the waters of Bartlett’s Harbor on North Haven Island in Maine sprang a beautiful mermaid who wanted to be immortalized in stone and live on land. Frederick Warren Allen caught her and granted her wish, placing her in the lovely garden of his friend the painter, Frank W. Benson, where she could still see the ocean from amongst the flowers on the hillside where he lived. Frank’s Wooster Farm was just over the hill from Fred Allen and his teacher Bela Pratt. Allen and Pratt lived and worked next door to each other on Bartlett’s Harbor. The men comprised three of the bohemian members of what was known as the North Haven Artists Colony. The Mermaid is an example of the difficulties of direct carving in stone. There is space between her left arm and her face that illustrates this point. Known as “through sculpture” where stone is completely removed in a part of the work, allowing the light and air to flow through, is risky business. A piece of the whole could split off if the wrong place is hit on the crystalline structure of the stone. In the case of this little charmer, it did not fall apart but, as he said himself, “There isn’t quite enough stone to carve that arm.” This same problem stumps many carvers, just when they think everything fits and is coming out well, they are foiled and have to stop and consider how to proceed, or whether to abandon the work altogether. 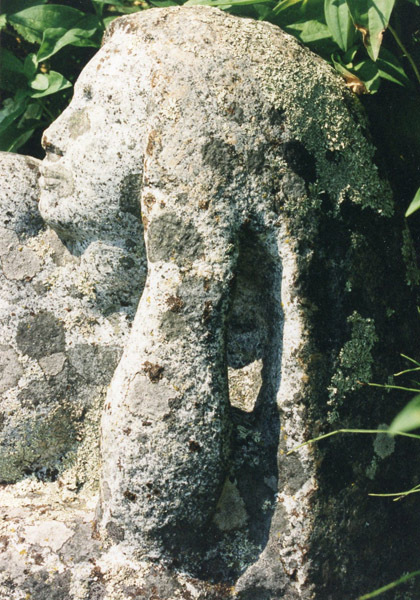 Lichen-covered granite Mermaid, North Haven, ME, F.W.Allen, Sculptor, carved for Frank Benson’s garden. A similar event happened carving the boy on the George Washington Monument in Fall River, MA. A black spot was found in the cheek of the boy child, so the whole figure had to be redesigned around that imperfection. The Mermaid stayed in Frank’s garden long after his death, the weeds growing around her and the lichen growing on her, eating into the stone. The new owners of the garden entrusted her into the arms of the Allen family where she was restored to a healthier state and given a protected place to live overlooking Bartlett’s Harbor where she first emerged and was given life. Save Outdoor Sculpture (SOS) gives new life to public art in the same way by taking inventory of outdoor sculptures, cleaning and treating them, and preserving them for our enjoyment. Literature: North Haven, Maine Summer 2012 Bartlett’s Harbor Artists’ Colony, exhibit catalog by Abbott, C.B.